Widely hailed as one of Milwaukee’s finest artists at the turn of the century, Paul Hammersmith (1857–1937) was originally trained as a watchmaker and engraver, then turned his skill for fine detail toward printmaking. Self-taught as an artist, he always carried a sketchbook. Fascinated by boats and water, he spent many hours sketching on Jones Island and the Milwaukee shoreline. 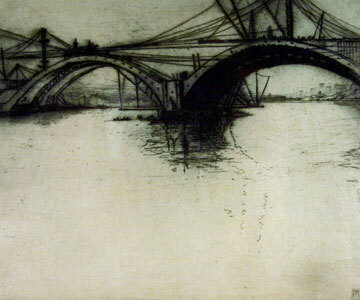 His sensitive, romantic etchings depict his experiences and surroundings in Milwaukee in addition to the many trips he took abroad with his wife and family.